The second single from “War” was released in March of 1983. To promote the single, Island issued a number of promotional singles to radio to support “Two Hearts Beat as One”. In some countries the commercial release of a single is also used as the promotional release and is just marked as a promotional item by stamping the sleeve or attaching a sticker. This was the case in France, where the commercial 7-Inch was used for promotional purposes and the back cover was stamped to note that it was a promotional item. Some copies of the 12-Inch single in Australia were also released with a sticker noting it as a promo on the back cover. Other promotional copies of the single are unique pressings. The 7-Inch in Canada had labels that specifically stated they were “promo only not for sale” and were released in generic sleeves from the record label. Tracks on the Canadian promo were the same as the commercial single. In the USA the tracks on the promotional single were “Two Hearts (7” Edit)” on one side and was labelled as being “Two Hearts (7” Edit – Mono)” on the opposite side. And in the UK a 7-Inch Jukebox promo was released in a white diecut sleeve. There was a 12-inch promo of note in the US market. The 12-inch was released in a generic blue Island sleeve, and contained three versions of “Two Hearts Beat as One” – the long mix, the album mix, and the 7” edit. This release was the only place to get the long mix of the song when it was first released. The catalog number on this unique release was DMD 643. Two Hearts Beat as One (7” Edit): Produced by Steve Lillywhite. Engineered by Paul Thomas. 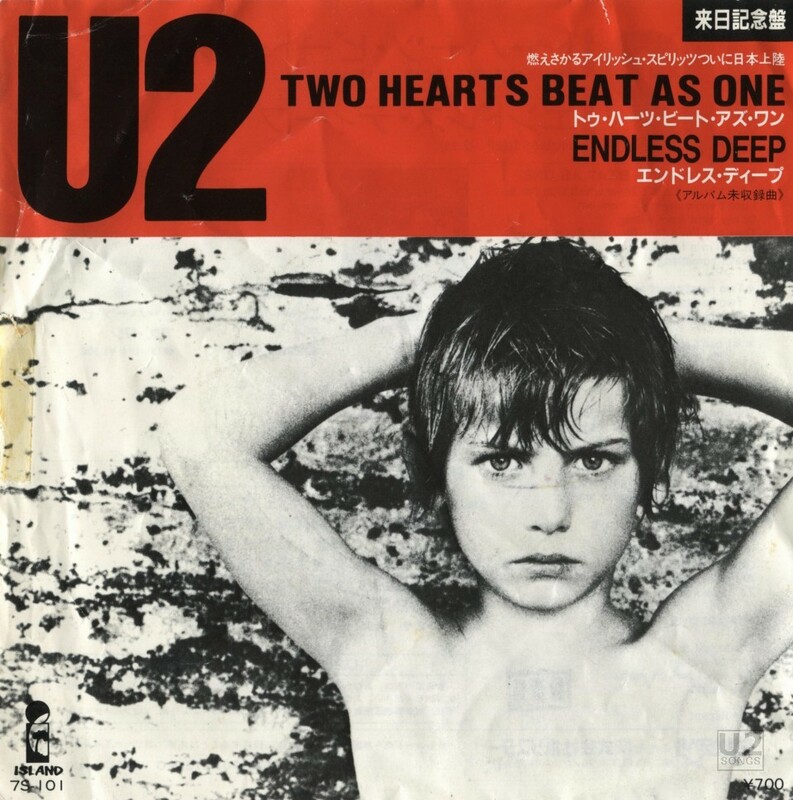 Two Hearts Beat as One (Mono): Produced by Steve Lillywhite. Engineered by Paul Thomas. Endless Deep: Produced by U2 / St. Francis Xavier. Engineered by Kevin Maloney. Two Hearts Beat as One (Album Version): Produced by Steve Lillywhite. Engineered by Paul Thomas. Two Hearts Beat as One (Long Version): Produced by Stevel Lillywhite. Engineered by Michael Hutchinson and Glenn Rosenstein. Remixed by Francois Kervorkian.